Was Your Flat a Labour Camp? Probably you always thought that slave labour, work without any basic safety equipment, leaving people without any money to live happens only in other far-away countries. Thanks to JW Construction, you can also find such things in Poland. Do you know how JW Construction maintains record profits during the crisis? A group of about 50 workers from China who worked building housing estates for JW Construction in Warsaw were not paid for their work. When the workers reminded the bosses of their rights, they were fired and the bosses applied to annul their visas and ordered them to leave Poland. They have been camping out in front of the Chinese Embassy, demanding the pay they are due. ZSP supports the Educational Strike in Germany taking place from June 15-19 and is planning an information action on June 19 on the 10th anniversary of the Signing of the Bologna Declaration. Our support for the struggle against the commercialization of education doesn't mean though that we support the preservation of educational institutions as they exist now. The Educational Strike in Germany is ony one of many action against changes in the financing of education and other sectors. Protestors are against changes which put profit above people and which restrict access to education, making it even more limited to the already priveleged parts of society. Introducing commerical aspects to education adjusts it to the needs of capital, but not to the needs of students. People are also protesting against the tendency of the state to reallocate public funds meant for a wide group of society. These changes will also have a negative effect on the working conditions of teachers, doctoral candidates, professors and other scholars and educational workers. Many of them may find themselves on the edge of precarious employment a some will lose their jobs. On June 4 1989, Poland held elections which marked the end of the era of the People's Republic of Poland. Grand ceremonies were held in many cities. Prime Minister Donald Tusk had wanted to hold a large international event in Gdansk but was afraid of massive (and perhaps violent) demonstrations by shipvard workers who lost their job due to an EU decision. They had demonstration recently in Warsaw and there were violent clashes with the police. Tusk decided instead to hold the event, attended by many foreign heads of state, in Wawel Palace in Krakow. Anarchists went there to show him that he could run, but he can't hide. Conference in Warsaw. "Bologna Process: Adjusting education to the needs of Capital"
6 June is the conference "Bologna Process: Adjusting education to the needs of Capital" organized by ZSP in Warsaw. Besides the members of ZSP from Warsaw and Szczecin, other groups will take part in the conference such as the "Reclaim your Education Group" from Wroclaw, the "Open Commitee to Liberate Educational Space (OKUPE)" from Gdansk and the Initiative Against Paid Studies from Krakow. It will be biggest and maybe most important event about this topic so far in Poland. As yet, there isn't protest movement against commericalization of studies and only these groups have made some local actions to raise awareness about this subject. Probably surpise for liberal students who will come will be radical discussion by led by Oskar from ZSP in Szczecin and ideas of speakers from ZSP Warsaw who claim that free education for small group of elites is not enough and criticize the system of education from anarchist position. 20 years ago in a cafe named "Surprise" on Constitution Sq. in Warsaw the Solidarity Campaign Office was located. June 4 marks the 20th anniversary of the first "free" elections in Poland after the fall of the PRL and all around Poland, events are being held to commemorate this date. On Constitution Sq. in Warsaw, the city, together with some organizations, opened up a mock cafe "Surprise" with photographs from this period. They are also gathering material now for an anti-communist "Museum of Communism". Today was the opening celebration which was to be ceremonially opened by the President of Warsaw, Hanna Gronkiewicz-Waltz. ---- Waltz, who is one of the leaders of the ultra-liberal Civic Platform and who is responsible for introducing rent hikes and speeding up reprivatization processes while doing nothing to improve the city's housing policies, has been called "Queen of the Slums" by the Tenants' Defense Committee. There have been a number of protests in front of City Hall, but the "Queen" does not want to meet with tenants. So tenants will have to follow her public appearances and meet her. The following is an interview with Michal from the Groenflex case. It was given to a local Dutch newspaper as part of an ongoing journalistic investigation into the practices of Groenflex and other work agencies in Holland. Hello, my name is Michal and I am 31 years old. Thank you for your interest in my case and what happened during my stay in Holland as a temporary worker. The temporary work agency Groen Flex is the Polish subsidiary of the Dutch company Eurocontract. My contact with the company was very short. On December 12th last year, I signed a preliminary contract with the company. I left for Holland on December 14th. I found Groen Flex through the internet. In Poland, the fall-winter season is idle in my line of work (I am a gardener by profession), so I have been looking for work abroad in the gardening/farming line of work. Why Holland? I have already worked in my profession in your country before, and as I have mentioned, this season is idle in Poland. Another reason to go so quickly was that my mother has breast cancer and a lot of money is needed for the treatment. Only working abroad could pay enough money to help my mother. The contract I have signed in Poland was only a preliminary agreement with Groen Flex. The proper seasonal work contract with Eurocontract was signed only in Holland in the Eurocontract office. The contract I have signed in Holland was written both in Polish and Dutch. While signing the contract, a translator working for Eurocontract was present. I paid attention to health insurance while signing the agreement in Poland and the proper contract in Holland. Both contracts stated that I was to be insured and that part of my wages would go to insurance. This turned out to be untrue, as I later found out. Today there were two pickets at Starbucks Coffee in Poland - one in Warsaw and one in Wroclaw, the two cities where Starbucks opened their first cafes in Poland last month. May 17 is the 5th anniversary of the founding of the Starbucks workers union, which we spoke about at the pickets. The pickets were organized by ZSP as solidarity campaigns but also to raise awareness about working conditions in the cafe/restaurant industry and to encourage workers to organize. On May 2, we had a picket in front of the newly-opened Starbucks in Warsaw, "welcoming" them to the Polish market. First people went inside to talk to the workers and give them leaflets explaining what our protest is about. Since the streets were quite busy, hundreds of leaflets disappeared in seconds. We spoke about the situation of the Starbucks union and the struggle of workers to earn decent wages, have good work schedules, the right to full-time employment, to benefits and to organize in unions. At the same time as the picket, by coincidence there was a street fair right next to us which was promoting ecological, locally-produced food and there were people handing out information against GMOs. Since this topic was present right next to us, we also spoke about globalization, about the coffee trade and other issues which also seemed to attract passerbys attention and support. 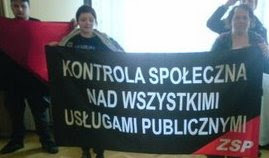 On May Day we organized a local demonstration and street meetings in the Praga district of Warsaw where there has been a recent protest movement of tenants who are fighting against rent increases and the reprivatization of some public houses. The day started with a street meeting with residents. related to rent increases which took effect May 1. Although there were fewer people than at recent protests, the neighbours were able to meet and discuss what to do next and how to attract more people to the movement. People were invited to a meeting to discuss an upcoming direct action. The main May Day event started in front of the Praga hospital. Besides people from ZSP, some comrades from Workers' Initiative and Anarchist Federation came, as well as some non-aligned people, some left activists and some local residents. The situation with the commercialization, restructuring and privatization of health care was discussed. The anarchists explained that we do not people in the two main choices given to people: either bureaucratic state-run health care or commericalized health care. Instead we proposed workers' self-management and public control and co-management of all public services. A lot of anarchist ideas for the reorganization of the work place and society were mentioned. The same ideas were repeated about the Post Office and the railways. receive a pay raise of 400 zloty (less than 100 euros) per month.